Most people go to Southern and Eastern Africa for the wildlife and scenery but actually it is a fantastic destination for those looking for a bit of history. After all Africa is the cradle of civilisation and the place were mankind was first discovered. There are many fantastic sites where you can see evidence of ancient times; from rock art to ruined cities, from fossilised remains to ancient living tribes there is something for everyone even remotely interested in Africa’s epic and important history. Ethiopia is one of the most historically and religiously significant places in the world with an exciting past that is still very much evident today. Those who visit Ethiopia are stunned by the vast number of holy sites which have amazingly survived pretty much intact. If you wish to visit the most important historic sites of Ethiopia then you should definitely include Lalibela, perhaps the most famous of them all. This site is home to 12 monolithic or rock-hewn churches including the Church of St George. How they managed to carve these churches from underground and the rock face itself back in the 13th century is just mind boggling. In Axum (Aksum), an ancient capital of Ethiopia and home to the Kings, you can find the basilic Church of our Lady Mary of Zion. This is believed to be the home of the Ark of the Covenant that Moses carried with him during the Great Exodus. No one is allowed access to it for fear of the dire biblical warnings associated with the Ark so many religious scholars doubt that the Ark is really there. There is plenty more to explore in Axum as there are many stelae or obelisks dating back 1700 years and historic royal palaces; a relic of the time when Axum was the capital of Ethiopia (from 400BC – 1000AD). Also worth a visit is Gondar which was once the ancient capital city of both the Ethiopian Empire and the later Begemder Province. 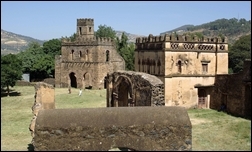 Gondar is home to many important remains including several royal castles, including Fasilides’ castle, Iyasu’s palace, Dawit’s Hall, a banqueting hall, stables, Empress Mentewab’s castle, a chancellery, library and three churches. Near the city lie Fasilides’ Bath, home to an annual ceremony where it is blessed and then opened for bathing; the Qusquam complex, built by Empress Mentewab; the eighteenth century Ras Mikael Sehul’s Palace and the Debre Berhan Selassie Church. There is so much history to explore in Ethiopia that you need a good couple of weeks to get the most from your tour. We have several different tours in Ethiopia that include the most important sites. South Africa is an incredibly rich source of cave paintings and one of the best areas to see many of them in in Kwazulu Natal in the stunningly beautiful Drakensberg Mountains. The area is now protected as a Unesco World Heritage Site. The San people (also known as Bushman) created beautiful rock paintings and engravings which you can see all around this area. There are over 40,000 of them in this area alone so they were pretty prolific! There are various walking tours that take you to sites that are close together and these trails usually have an information centre where you can learn more about them or hire a guide to show you around. We have a great range of beautiful accommodation in the Drakensberg Mountains including Cathedral Peak and Cleopatra Mountain Farmhouse and some great South Africa self drive tours that pass through the Drakensberg. The Kamberg San Rock Art Trail is incredible and includes such sites as the Game Pass Shelter. The San paintings are now national monuments protected by law but were first discovered back in the early 1900s. At first they were thought to be simple depictions of daily life such as hunting but nowadays experts believe that the artwork is actually made up of mystical images that were seen by shamans whilst in a trance. 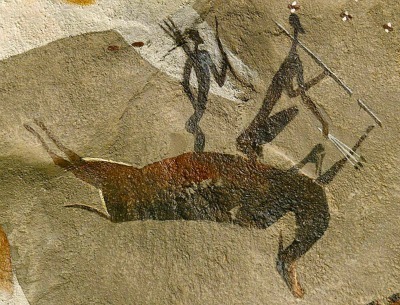 Among the most accessible of the many Drakensberg rock art sites is the open-air Bushman Cave Museum in the Giant’s Castle Reserve, established in 1903 and run by KwaZulu-Natal Nature Conservation. A short walk takes you to the cave, which features 500 rock paintings, some of which are estimated to be around 800 years old. However if you are a fit and adventurous hiker you can take yourself off to more remote trails where you will be able to discover caves on your own! Olduvai Gorge in Tanzania is actually one of the most important paleo-anthropological sites in the whole world and you can visit it on one of our Tanzania safari holidays. You can visit en route to the Ngorongoro Crater. This site was part of a scientific discovery that rocked the scientific world. It allowed scientists to date early mankind for the first time as it was here that remains were found from millions of years ago. Olduvai turned out to have been occupied by Homo Habilis 1.9 million years ago, Paranthropus Boisei 1.8 million years ago, and Homo Erectus 1.2 million years ago. Modern mankind known as Homo Sapiens is dated to have occupied the site 17,000 years ago. Louis and Mary Leakey were the paleo-archaeologists responsible for most of the excavations and discoveries of fossils in Olduvai Gorge and their family have since continued their work and even today scientists are still continuing to discover important finds in the area. The Leakeys were firm believers in Darwin’s theory of evolution and were sure that early man had lived in the area. They followed other scientists finds but it was their discovery of a homonid skull that meant Tanzania was truly the origin of mankind. In 1959, Mary found remains of the robust australopithecine Zinjanthropus boisei (now known as Paranthropus boisei) which has been one of the major scientific discoveries of all time. This is because the age of the skeleton was put at 1.75 million years and this dramatically changed what had been the previously estimated time scale of human evolution. The Great Zimbabwe ruins are the largest collection of ruins in Africa south of the Sahara such as Libya, Egypt and Morocco. Located in Zimbabwe between the Zambezi and Limpopo Rivers, the ruins are remains of an ancient culture of great wealth and impressive architectural skills. Built between the 11th and 15th centuries, Great Zimbabwe was home to a cattle-herding people who also became adept at metal-working. The ruins are the largest of their kind on the Zimbabwe Plateau, but they are by no means unique. 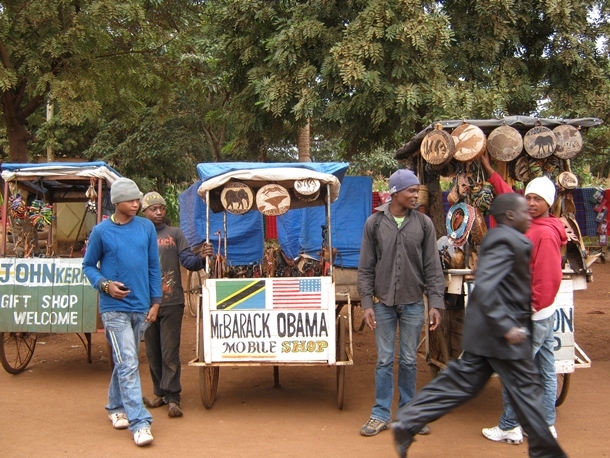 There are lots of much smaller sites across Zimbabwe and as far as Mozambique. Great Zimbabwe is impressive as it was once home to up to 20, 000 people in its heyday. The remains are made up of granite walls – embellished with turrets, towers, platforms and elegantly sculpted stairways which show a huge amount of skill and expertise in architecture and engineering for such an early civilisation. Although the site was ransacked by European explorers and treasure hunters it is still an incredible place to visit and well worth a visit. 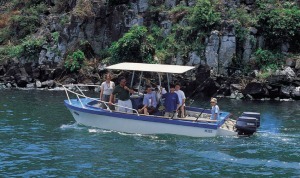 It can be combined with a tour of Southern Africa or a safari in Zimbabwe. So important are the ruins to the nation that the country actually took its name from the Shona word for ruins, ” Zimbabwe”. Are you sitting at work dreaming of escaping to a tropical island in the sun? Forget the Caribbean, Africa has some truly gorgeous island getaways just right for escaping the cold winter or a wet summer. Some are tiny with just a handful of rustic hideaways whilst others are much larger and more established with lots of luxury hotels, fantastic water-sports and world class restaurants. All of them have sublime scenery; some have dramatic rocky coves whilst others have dreamy beaches with white sand and turquoise waters. Here are the first 5 in our top 10 as voted by the Real Africa team. Mfangano Island is found at the eastern end of Lake Victoria and it is one of the team’s favourite islands. The island is a great combination of beautiful scenery, laid back African atmosphere and great wildlife. You can while away many hours just relaxing on the island watching the incredible birdlife or going fishing for your supper. It is also home to one of our favourite camps run by the team behind Governors Camps. Mfangano Island Camp is a luxury, island hideaway lodge lapped by the waters of Lake Victoria, shaded by giant fig trees, and a secluded atmosphere. There are beautiful lush gardens set on a private bay with enormous boulders which sit at the water’s edge providing a perch for cormorants or giant monitor lizards to sun themselves. You will feel a million miles away from the hustle and bustle of everyday life on Mfangano. 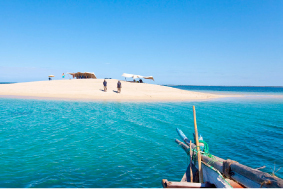 Our intrepid explorer Lily nominated Ibo Island as one of her favourites having travelled to Mozambique last year. Ibo Island is part of the famous Quirimbas Archipelago which nestles in the Indian Ocean just off the coast of northern Mozambique. Once Mozambique’s mighty trading centre, Ibo Island has remained all but forgotten to the outside world for almost a century. Wander around this colonial little island town and hear tales of pirates and prisoners, turtle shells and silver. Explore old forts and ancient romantic buildings where you can almost feel the history come to life. Ibo is home to some wonderfully majestic historical architecture, some beautifully restored and some left as atmospheric ruins. Add to this almost dazzlingly white sandy beaches and warm turquoise waters, mangrove swamps and quaint fishing villages, giant sand dunes and lush greenery and you have a real paradise. Mozambique and the waters off Ibo Island are also famous for their pristine coral reefs and incredible marine wildlife including manta rays, rare dugongs, a variety of dolphins and all sorts of species of whales. We offer holidays to Ibo Island Lodge which is an award winning beach hotel with a fantastic location and stylish luxury accommodation. Pemba is a small island off the coast of its larger and more famous neighbour Zanzibar. Its remote location and small size has meant that it remained an untouched and pristine island of great beauty and history. The lush mosaic of forests, swamps, mangroves, and gently undulating hills combined with stunning hidden beaches and quiet lagoons makes for a serene and beautiful island getaway. The history of the island is told in the scattered ruins of mosques and tombs hidden away in the forest, some of which date back to Arab colonisation in the 17th century. Likoma Island is another very popular destination amongst the team. It is unusual in that it actually sits in Mozambican waters but is still part of Malawi. 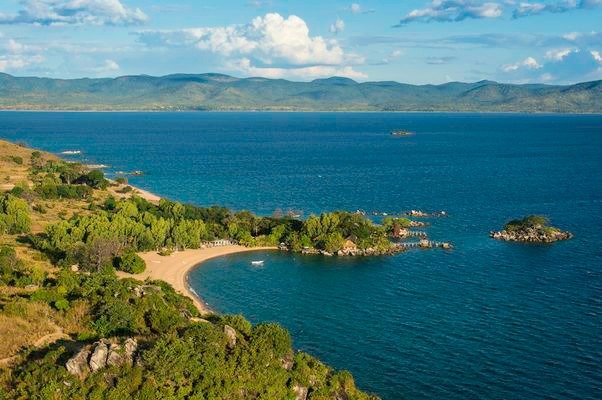 Likoma has a gentle, pretty landscape made up of rolling grassland dotted with trees, secluded coves and beaches and stunning views over to the mainland. There are a handful of hotels on the island but very little traffic as there are no paved roads and people travel by boat. The waters here are crystal clear and warm making it perfect for snorkelling, diving, kayaking, fishing and sailing. The waters of the lake are also home to wonderful birdlife and the whole atmosphere is very peaceful indeed. We offer stays at the wonderful Kaya Mawa which is a 5 star luxury lodge with incredible views, secluded beaches and gorgeous rooms. It was voted by Conde Nast as one of the top ten most romantic places in the world. Another small island off the East African coast and part of the Zanzibar archipelago, Mafia Island is a proper Robinson Crusoe desert island. It is a place to get away and soak up nature in all its finest. Mafia Island’s coral reefs are renowned as an excellent, world-class diving destination. Scientists have confirmed that Mafia has some of the richest reefs in the world, with an unparalleled variety of hard and soft corals and diversity of tropical fish. If you are not one for diving you can explore the island’s nature trails and discover the hidden ruins of lost buildings reclaimed by the jungle. However it is really the gloriously pristine white sandy beaches lapped by gentle warm waters which you tend to have all to yourself that attract most people to Mafia Island. It is wonderfully peaceful and calming and a perfect place to relaxing. We offer a fantastic little rustic retreat called Chole Mjini if Mafia Island sounds the place for you. If you fancy turning your daydreams into reality then give us a call and we can fix you up! Whether you favour mongooses, or (rather controversially) mongeese, I think most would agree that this picture of the aforementioned taken by Marco, one of our guides in Tanzania, in the Serengeti, is a worthy winner of the Guides’ Monthly Image competition. Congratulations Marco – we love it and were particularly taken by the way you captured them all huddled together looking so alert. 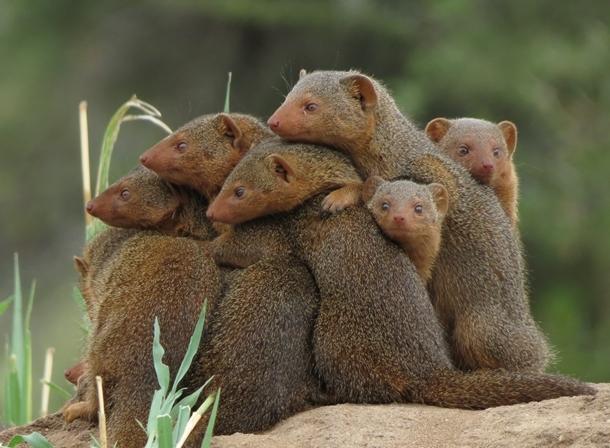 Mongoose are a common sight across Africa but can also be found in Europe and Asia with some 33 species. They live in burrows, usually ones that have been abandoned, preferring a rocky landscape but are highly adaptable and feed on small birds, insects, worms and reptiles. Some species of mongoose are known for their ability to take on venomous snakes – this was famously described by Rudyard Kipling in the Jungle Book with fictional character Rikki Tikki Tavi.They have very sharp claws which are non-retractable, are fast and agile, and have some degree of protection from some snake venoms due to the shape of acetylcholine receptors (neurotransmitters in the nervous system). Mongooses live for around 4 years in the wild. The female has one litter a year of around 4 babies, who are born blind. Most have brown or grey fur but the banded Mongoose has black stripes on its lower back and is easy to spot. They are ingenious little creatures and interesting to observe, breaking open eggs by throwing them against a rock or bashing them with a stone. They are always highly alert, as pictured, setting off ‘an alarm’ if spotting a threat approaching. In some countries, such as Hawaii, they are considered a pest. Initially introduced to control vermin, the mongooses ended up decimating the native bird population. Most species of mongoose are now banned from being imported into the States and also to Australia. Thanks again Marco – it is easy to be distracted by the Big Five and all the other wonderful large mammals in Africa, and as a result many of the smaller ones get overlooked. It is good to know that our guides are on the look out for all the birds and smaller creatures that make up Africa’s supporting cast as well as keeping their eyes peeled for those in leading roles. Find out more about Marco here. Big congratulations to Charles Titus, one of our guides in Tanzania, who has won the June image competition with his market scene. See any familiar names? The guides take many wonderful pictures throughout the year. These often tend to be of wildlife and scenery since they spend the majority of their time introducing our clients to the beautiful and varied parks and reserves of East Africa. We are always very excited to find images snapped spontaneously like this one, away from the parks. The picture literally give a snapshot of life in East Africa. This one is particularly amusing and very colourful. Well done Charles. You can find out a bit more about Charles here. Getting your children into the right school is a worry for many parents. People move house to get into the right catchment areas, others hire tutors or start attending church. There are no such worries however for Masai elder Mzee Oloiboni Meshuko Ole Mapii, who lives in the village of Eslalei in the Ngorongoro Highlands of Tanzania. Here a school has been built to exclusively educate all his children and grand-children. As the senior elder of the village which he founded over 60 years ago, he is now a wealthy man, with large herds of cattle and goats. This has allowed him to take a total of eight wives, and his family has grown over the years to in excess of 300. The school currently has 160 children enrolled, and all of them are either his children, grandchildren or great grandchildren. They fill six classrooms. “I am so proud of my wives and all family members,” said Mzee Oloiboni, speaking recently. Despite estimating his age at over 110, he still sits out every day to answer questions from his family and help give advice over the husbandry of his herds. He is a great advert for his preferred Masai diet based on milk and blood.